Gerald Mason was born in December 1897 in Agra, Bengal, India, where his father, the Rev. Charles Mason was a Diocesan Inspector and Indian Government Chaplain. Gerald was one of nine children. 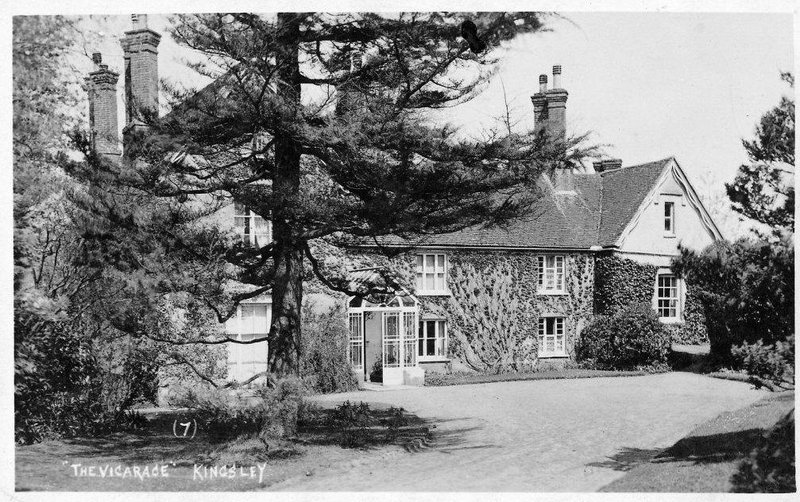 His family moved back to England in 1908 and from 1916 to 1919 his father was the Curate of Binsted with Kingsley, living in the Vicarage at Kingsley. Once back in England Gerald was sent to Denstone College in Staffordshire, in May 1910 (aged 12). Whilst at boarding school he was a Prefect, obtained his XV Colours and was in the OTC. 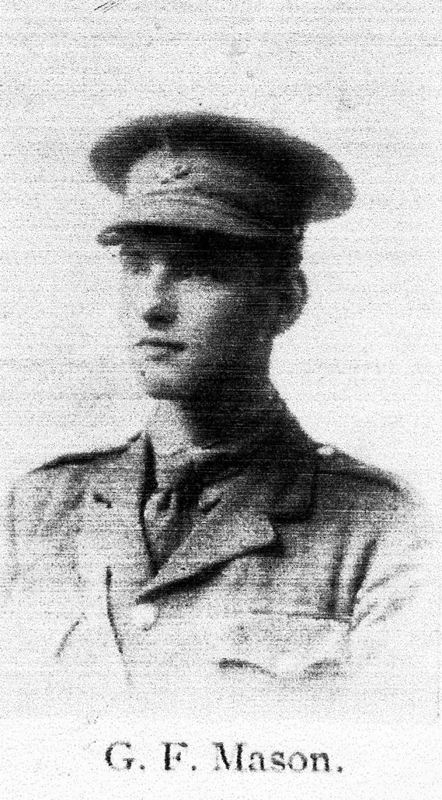 He left Denstone in December 1914 and was gazetted to a commission in the Hampshire Regiment within six weeks of his 17th birthday, on February 3 1915. Within a year he was promoted Lieutenant. He then obtained a transfer to the Machine Gun Corps and went to France in September 1916 (aged just 18). He was in much heavy fighting, particularly at the “push” at the Chemical Works at the Battle of the Somme on 3 May 1917 when he was wounded in five places. He convalesced at Menton where he wrote that he was “having an excellent time, being billeted in a first class hotel”. On his return to duty he was transferred to the Tank Corps but after being home on leave he was killed riding his motorbike on 1 September, at Virginia Water. He was returning to duty. The full military funeral took place in Kingsley. “The body, in an ‘earth coffin’, provided by the London Necropolis Company, was fetched from Englefield Green Mortuary by a motor ambulance. 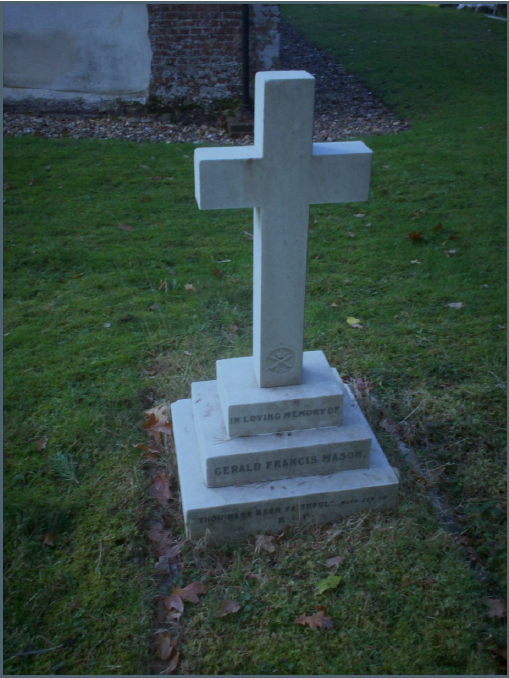 Opposite Kingsley Vicarage it was met by a gun carriage from the RFA, Bordon, the RFA band and a firing party from the Tank Corps…..
Lt. Mason’s gravestone is located to the east of St Nicholas church and for many years was maintained by the War Graves Commission.